Brooklyn Height Prenatal is hosting a workshop that incorporates belly dancing to prepare women for labor. BROOKLYN HEIGHTS — These pregnant Brooklyn women are dancing their way to delivery. Recently launched Brooklyn Heights Prenatal — a local collective dedicated to the needs of pregnant women — is hosting a new workshop that incorporates hip circles and figure eights, undulations, veil dancing and other belly dance techniques to help women prepare for labor. "The movement vocabulary of Middle Eastern dance has been used by women for thousands of years to aid in fertility, pregnancy and the birth itself," said workshop instructor Julia Arenson. "These are low-impact, organic movements that increase blood flow, relaxation and focus in women." 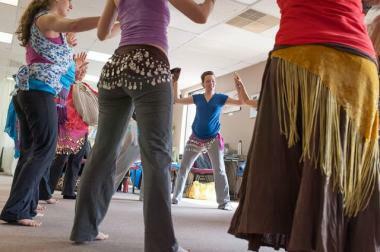 Arenson began belly dancing 25 years ago and used many of the movements during her own labor. Between contractions she found herself naturally circling her torso and performing pelvic tilts. The movements helped to "open her hips and feel the flow of labor." They also help to "bring the baby down" during labor. A trained doula and prenatal yoga instructor, Arenson began teaching her clients years ago to use belly dancing movements in labor, but this is her first time teaching a workshop to a group of women. Brooklyn Heights-based Area Yoga is hosting the class that also uses an exercise ball — called a birth ball in the workshop — and yoga to help women prepare for labor. And beyond the physical benefits, the "Dancing to Delivery" workshop also helps build confidence, Arenson said. "Dancing is very sensual and it helps women with self-esteem and brings them into a mind-body connection," she said. "It can tap into a more primal brain and that in itself is very helpful for birth and labor; it helps you get out of your head and keeps things as peaceful as possible." "Dancing to Delivery" takes place on Jan. 19 at Area Yoga in Brooklyn Heights. To find out more email brooklynheightsprenatal@gmail.com.